** This property does not permit pets at any time. DETAILS: Newly Remodeled April 2017! 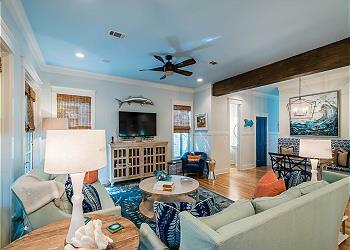 Located only 2 blocks from the white sandy beaches, this luxurious cottage is sure to provide your family with the perfect home away from home. Luxury is the theme of this home and you will find many special touches throughout. The main floor living area boasts tall French doors and windows that let in lots of natural light and open out onto a wonderful screened-in porch with plenty of seating. The main living room offers ample, cozy seating and a flat screen television. The dining area seats 8 and is adjacent to large French doors that also lead out to the porch. Next to the dining area is a long open kitchen and island, featuring stainless steel appliances and beautiful white, marble countertops. The luxurious master suite is located on this floor and offers plenty of windows and doors opening to the back deck area. There is a king-size bed, TV, and has a gorgeous connecting bath which features two vanities, a large soaking tub and a separate shower. The second floor features 3 large and bright bedrooms. The first bedroom has a king-size bed, a television, a furnished balcony and an en suite bathroom featuring a double vanity and a shower. The second bedroom offers a queen and a twin bed and has a connecting bathroom with a single vanity and a shower. The third bedroom has 2 queen-size beds, a flat screen television and a connecting bathroom with a single vanity and a tub-shower combo. Additionally, there is a sitting area on the second floor as well as a half bathroom and the laundry room. This spacious home also features a carriage house that boasts lots of windows. This studio style carriage house has a queen sized bed and a bathroom featuring a single vanity and a shower. The living area has plenty of seating with a sofa and a comfortable side chair. The dining table has seating for four and is located right off of the kitchenette. The house at 99 Mystic Cobalt was perfect for our group of 10 adults. With two master suites and a private carriage house it gave us the space we needed as well as two kitchens to store and prepare holiday meals. The location was a very short walk to all the activity yet far enough to escape the crowds. A perfect bike ride to Greyton Beach and an artsy adventure with the Shard Shop is a MUST! The people at 360 Blue were incredible to work with from helping find the perfect home to final check out. This group is spot on in the service department. What a pleasure it was to host you all here in Watercolor! Thank you for sharing such a wonderful photo with us and we agree that this home is located in a perfect spot and the accommodations are hard to beat for larger groups! Thank you for staying with 360 Blue, we hope to see you again soon! Happy belated birthday! We are so delighted that you all enjoyed your celebration vacation with us in Watercolor! We agree that this house has so many wonderful features to offer and enjoy and we especially loved the photo you shared with us! We look forward to seeing you all again soon! Our family of 13 including grandparents and kids ranging from 12-19 absolutely loved staying at 99 Mystic Cobalt. The house is set up with so many amenities, designed so smartly, and beautifully decorated both indoors and out that it made our stay not only comfortable and worry free, but even more so, amazing. Lots of room and well thought out spaces for storage, and the location is awesome too - so close to Water Color, Van Ness beach, and Seaside. You can tell the owners really care about their home and about allowing their guests to have the best vacation possible. I must mention the impressive customer service from both the owners and 360 Blue when initially the wifi signal was weak in the carriage house. Both worked together quickly and thoroughly to address the issue even upgrading equipment to make connectivity a breeze for the vacation. If we have the chance to return we will definitely look at this property or only 360 Blue properties again, and highly recommend the house! We are beyond thrilled that you and your family had such a wonderful time with us in Watercolor! We completely agree that this home is a perfect option for larger groups and families and has the best of the best in accommodations! We are also so glad that you had a great experience with 360 Blue! We strive to provide the best customer service for our guests and we are glad to hear we did just that! We look forward to hosting you and your family again very soon!